Watch your ideas travel off the page and evolve on screen with the new generation Moleskine paper tablet, pen+ and companion app. Enjoy the hands-on immediacy of putting pen to paper, teamed with all the advantages of digital creativity. Encoded technology allows the pen+ to recognize where it is on the paper tablet and capture each pen stroke as you capture your thoughts. The app then smoothly transfers your freehand notes from page to screen in real time, giving you the possibility to digitize text, edit, organize, share and bring your ideas to life. Simply tap the envelope icon on the page to share instantly. 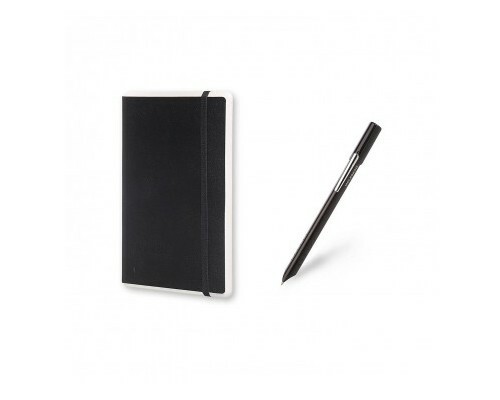 An essential tool for business, education and art professionals, the smart writing set includes: paper tablet with special paper designed to work with pen+ in dotted layout pen+ smart pen, USB cable for smart pen recharging, 1 pen tip ink refill and user manual with the history of Moleskine inside. Moleskine notes app can be downloaded for free from the app store and on Google play. Part of the wider M+ collection, this smart writing set combines the tools you Love to enable seamless creativity, wherever you are. Naturally analog, conveniently digital, very Moleskine. Moleskine was created as a brand in 1997, bringing back to life the legendary notebook used by artists and thinkers over the past two centuries: among them Vincent Van Gogh, Pablo Picasso, Ernest hemingway, and Bruce chatwin.